If ever you find out that your well water is contaminated, then don’t worry that much because a whole house water filtration system can protect you and your family from all kinds of harmful contaminants and impurities. A water filter could either use a chemical, a biological process or a physical barrier to filter your well water and make sure that it is safe to drink. They may even improve the taste of the water. If you choose this as a method to treat your well water, then this guide will help you find the best whole house water filter for well water that will suit your needs. Bear in mind that whole house water filters can remove most common contaminants from well water, but they may not be the best option for treating the hardness of the water. A water softener should be used in combination for the best result. 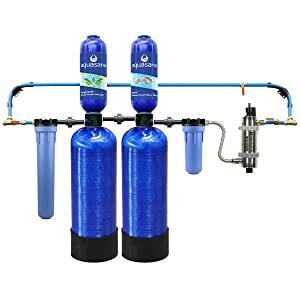 The best and most cost effective whole house water filter for well water on the market right now is the Aquasana Well Water Triple-Stage Whole House Water Filtration System. This water filter have a specific filtration system that is equipped for cleaning even the dirtiest water, stripping out the greater part of the bacteria, chemicals, toxins, and so on yet leaves the minerals! Well water is water that comes from the ground, literally called groundwater. We use a water pump to pump fresh water from a well to a residence for consumption. Most well water comes from rain and melting snow soaking into the ground. Water fills the spaces between rocks and soils, making an “aquifer”. Well water always contains some natural impurities or contaminants, even with no human activity or pollution. Natural contaminants can come from many conditions in the watershed or in the ground. Water moving through underground rocks and soils may pick up magnesium, calcium and chlorides. Some well water naturally contains dissolved elements such as arsenic, boron, selenium, or radon, a gas formed by the natural breakdown of radioactive uranium in soil. These elements cannot be seen to the bare eye. About half of our nation’s drinking water comes from groundwater. Most are supplied through public water systems which are maintained by municipalities. But many families rely on private wells and use groundwater as their source of freshwater. Why Do I Need A Whole House Water Filter System? The reason why you need the best whole house water filter for well water is simple. We all understand that water is basic to life. And safe drinking water is a fundamental human need. When your home is supplied with water from a well on your property, you are responsible for making sure that the water is safe. According to Centers for Disease Control and Prevention, polluted well water can cause nausea, diarrhea, and vomiting and the presence of harmful contaminants in the water could lead to serious health issues, like cancer, neurological problems, reproductive problems and gastrointestinal illness. Contaminants known as nitrates are particularly unsafe for newborn children since they can disorganize oxygen flow in the blood of infants. Infants, young children, pregnant women, the elderly, and people whose immune systems are compromised because of AIDS, chemotherapy, or transplant medications, may be especially susceptible to illness from some contaminants. Using best whole house water filters will help guarantee that well water is totally safe to drink. 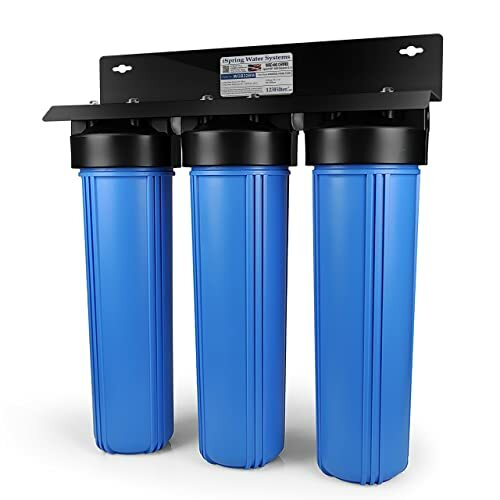 The Aquasana Well Water Triple-Stage Whole House Water Filtration System is one of the most popular well water treatment systems on the market so far. And we believe that this is the best whole house water filter for well water you can buy. Most buyers are happy with the quality of the product and the fact that most of them left a positive review for this water filter. Because Aquasana designed this whole house water filter specifically for well water contamination, we’re very confident that it will protect you and your family from bacteria, viruses, minerals, leads, and other contaminants commonly found in private well water. And the fact is it did an amazing job in our test and the water was very clear and sweet. What makes Aquasana Well Water Triple-Stage Whole House Water Filtration System the best whole house water filter for well water? Unique upflow, dual tank, multi-stage design increases water contact time with contaminant grabbing media and prevents clogging or media channeling. 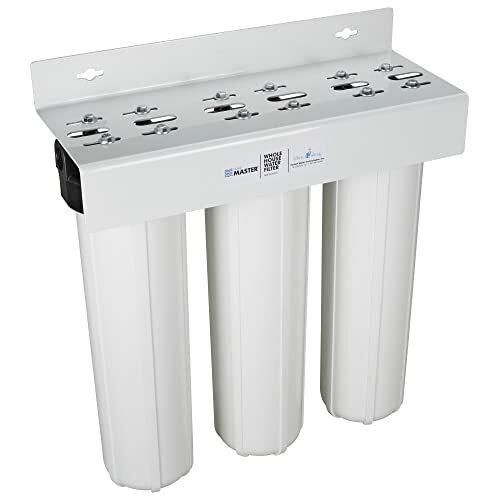 Salt-Free Water Softener: uses water flow to naturally alter the structure of hard mineral ions into a crystal structure that prevents the minerals from binding and forming scale buildup. SCM salt-free softening is proven to reduce scale on internal pipes and plumbing. Unlike salt-based softeners, Aquasana will not demineralize your water, harm your pipes with harsh salt, or put excessive amounts of sodium waste into our communal water supply. 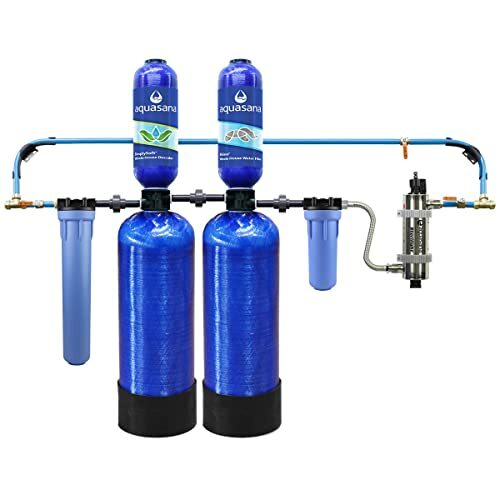 A complete system like this will ensure that you and your family receive safe and healthy high-quality pure water for drinking and other household use. The Aquasana Well Water Triple-Stage is the best whole house water filter for well water available and you can’t go wrong with it. The matter here is that it’s relatively expensive compared to other whole house water filter systems on the market. That’s probably because this is an all-in-one well water treatment system whilst other systems are only a water filter. So if you can’t afford or already have a water softener, consider the Aquasana 6-Year, 600,000 Gallon Whole House Water Filter or the following options. One of the very best whole house water filters for well water is the Home Master HMF3SDGFEC Whole House 3-Stage Water Filter. This water filter is very efficient in removing iron, manganese, sulfur smell, pesticides, herbicides and other contaminants from well water. It uses oversized filters, housings, and fittings whenever possible to ensure your water pressure never falls short. Larger housings mean larger filters, which require less frequent service, which in turn saves you time, money, and inconvenience. 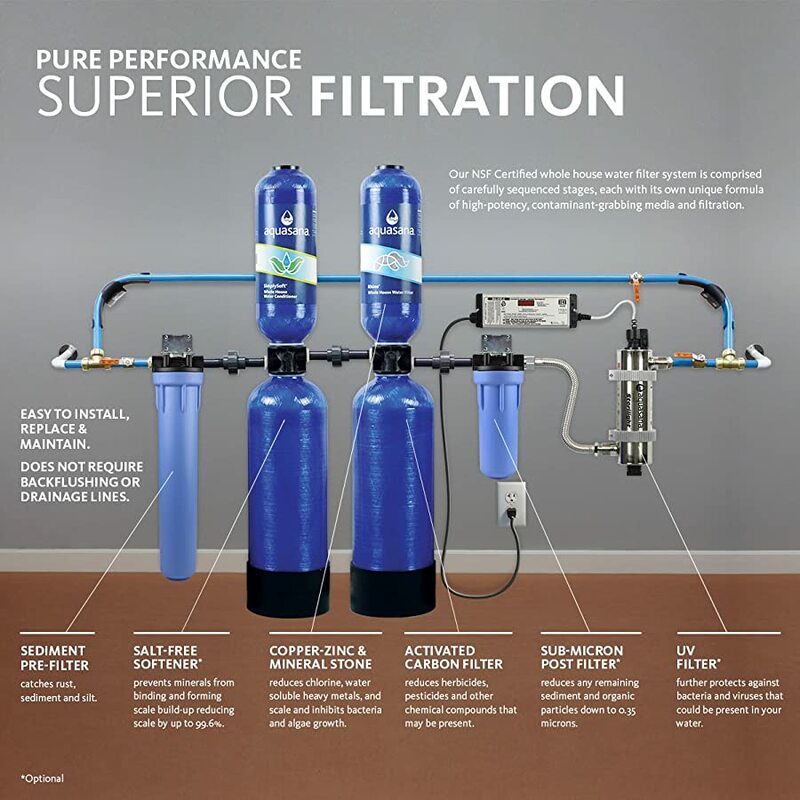 To turn “smell water” into “good-tasting water“, the Home Master uses 3-stage filter system that is specifically for well water. The first stage is a 4-layer depth polypropylene sediment filter: 25-micron surface, 10-micron layer, 5-micron layer and 1-micron inner core, designed for purity with bacterial and chemical resistance. It typically lasts 12 months depending on usage and sediment quantity. The second stage reduces iron, manganese and sulfur: the radial flow design provides excellent filtration with minimal pressure drop (less than 1 PSI) to effectively reduce iron, manganese and sulfur smell in water up to 3 PPM combined contaminant load. The third stage features a radial flow granular activated coconut shell carbon that removes chemicals, taste and odor up to 95,000 gals. Best for families of four. These 3 stages combined makes the Home Master HMF3SDGFEC one of the best whole house water filters for well water on the market. And we think that it’s hard to find any other model that is better than this one for the same price. iSpring makes some of the most affordable water filters that come with cutting-edge water treatment technologies. The iSpring WGB32BM 3-Stage Whole House Water Filtration System is iSpring’s best whole house water filter for well water. The first stage: housing holds a 5-micron high-capacity polypropylene sediment filter. This filter removes dirt and other various larger sized particles from the water that can clog the following filters. The second stage: houses a 5-micron CTO coconut shell carbon block filter. Block carbon is more effective than other forms of carbon in that it is finely ground up carbon packed into a solidified block. This means they have a higher density than other types of carbon filters, and are therefore more effective in removing their targeted contaminants. The carbon block filter knocks out bad tastes and odors, removes over 90% of chlorine from the water, and is highly effective on organic chemicals (VOCs) like pesticides, herbicides, and industrial chemicals. The third stage: has an iron and manganese reducing filter – also great for the plethora of heavy metals found in well water sources. The iron and manganese reducing filter has the unique ability to remove arsenic under the proper conditions.